3)Multiply printing modes and formats, including auto 12x1, auto 6x2+1, auto 6x2+1_H, auto 6x2, auto 6x2_H, auto 3x4+1, auto 3x4+2, rhythm 12, rhythm 10, rhythm 8, rhythm 6, manual, etc. Trend chart and histogram of P-R interval can be printed, waveform length printed can be adjusted, and with time print function, which meets different requirements. 4)Paper speed: 5mm/s, 6.25mm/s, 10mm/s, 12.5mm/s, 25mm/s, 50mm/s. 5)With the functions of auto-analysis and auto-diagnosis for routine ECG parameters, provide measurement results and auto-diagnosis conclusion for HR, P-R interval, P Duration, QRS Duration, T Duration, Q-T interval, Q-Tc, P Axis, QRS Axis, T Axis, R(V5), S(V1), R(V5)+S(V1), etc. which reduces the doctor’s burden. 6)Built-in memory stores up to 1000 cases, convenient for case review and statistic. 7)Multi-language(Turkish, French, Chinese, English, German, Kazakstan, Polish, Portuguese, Russian, Slovenian, Spanish and Ukrainian) interface and report. 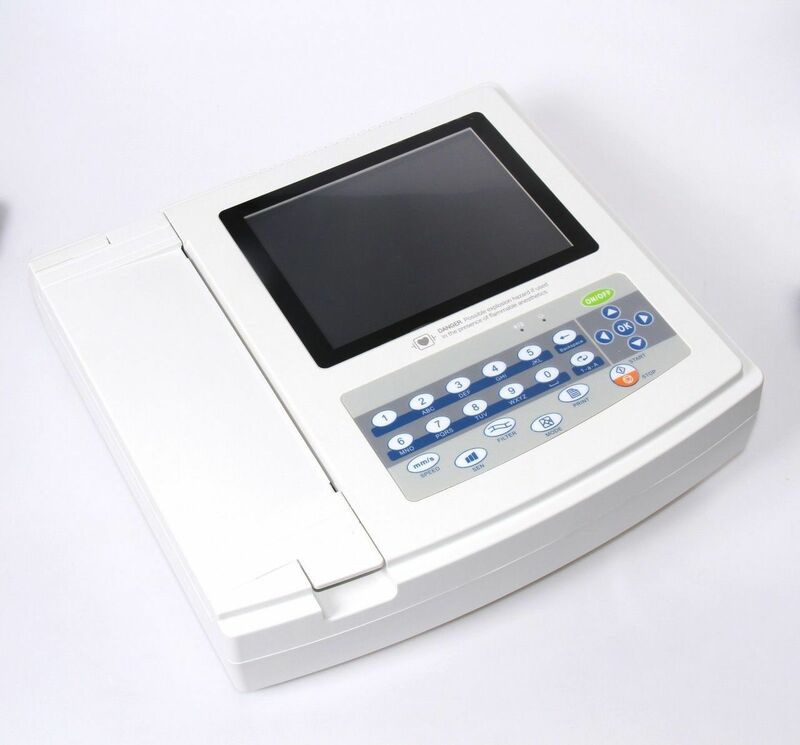 8)In optimal DC state, up to 10-hour standby time, continuous print more than 3-hour, record up to 300 ECG waveform(commonly, it is 3s case), which meets the requirements of visiting a patient at home and body examination. Auto record: set record according to auto record format and mode, automatically switching leads, measuring and analyzing. Rhythm record: set record according to rhythm record format and mode, automatically measuring and analyzing. Manual record: set record according to record format, manually switching leads.